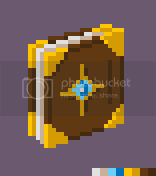 It's a bit of a giant leap backwards from what I've previously been working towards (more realistic painting) but I've been following along with an online course thing in pixel art, because I'm crap at staying focused on one thing. It's nothing flash, but I'm getting to be a little more productive so I figured I'd share some stuff as I get through it. I can't share any of the actual course materials since the guy charges a couple of bucks for the course (not much, it's on a site called Udemy if you care) but I'm sure I can share my work, even if it's the result of exercises he's set. Character (from provided concept), I'd have been happier with more frames. P.S. Some restrictions are enforced during these exercises such as pixels x pixels space and number of colours. Last edited by Steasaurus : 01-25-2017 at 03:57 PM. Easiest way is to set scaling type to nearest neighbor, and then image size up by a whole-number multiple. Of course, you should only do this for display purposes, really, and not work at this new higher res. Nice work, the animations especially. They're limited, but they read very well. The chalice I think could use a bit more of the dark shade, and some highlights popping up on the back rim as well. The glass on the windows fades a bit too well into the frame, a few lines here could help with that. Ah yes, the windows I noticed they were too light and got lost in with the frames. Ultimately, I'm not going to fix most of what I post since they relate to exercises that I'm not particularly passionate about. If it was a personal project or I was being given money for the results I would definitely go back and fix stuff. I will be taking any advice on board though, for the sake of anything I do in the future. 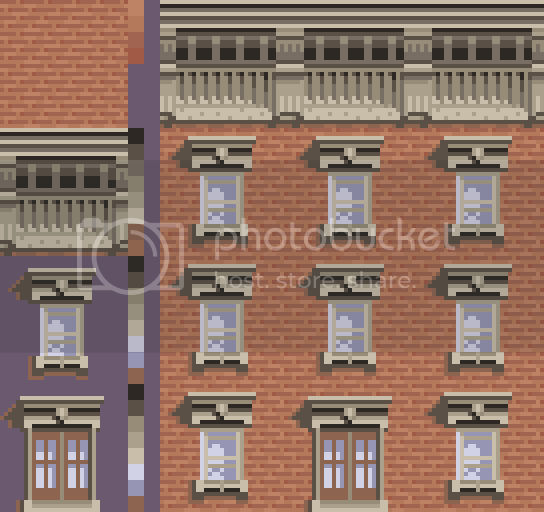 All that said, however, I think I will fix up the windows on the building. I enjoyed working on that the most so it won't be as much of a chore to go back to it. I'll also edit my first post with increased sizes at some point. I'll also switch from attachments to photobucket. It was down for maintenance the other day. I went really simplistic with the next assignment that had us produce a tile set for waterways. I did start with more detailed grass but decided to drop the detail back a little to make things easier for myself. Laziness. I decided that it didn't look right with the water so still, so I went back to the water tile and animated it. 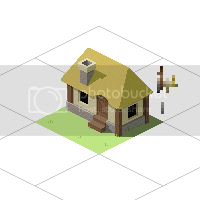 So then, using smart objects and masking in photoshop, I added the animated tiles into the tile set. 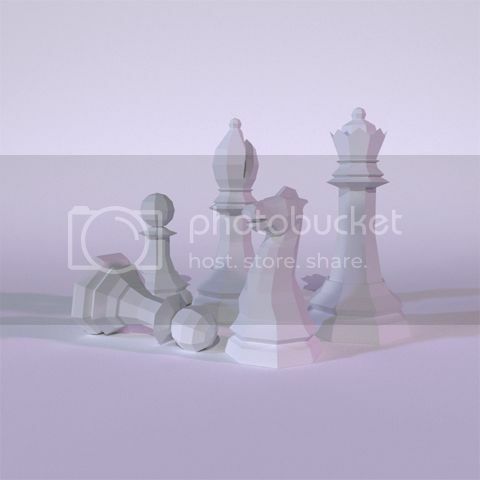 Obviously the tile set would be duplicated for each frame and kept still for actual utilisation. But here it is. Do you use any preset palette or do you create your own ones? If it is a preser I want it Absolutely love the control over shapes in the building tileset. These are perfect man! The palette isn't preset. We chose our own colours. We're encouraged to limit ourselves so I opted to use 8 colours for the majority of the building tiles but only needed 4 for the brick wall tile. We had a strict 3 colour per section advised for the character, such as 3 for skin, 3 for orange clothing, 3 for pants etc. I kind of cheated by bringing a dark colour from the boots for the facial details, which I guess pushed the head section to 4 colours. Ah well. 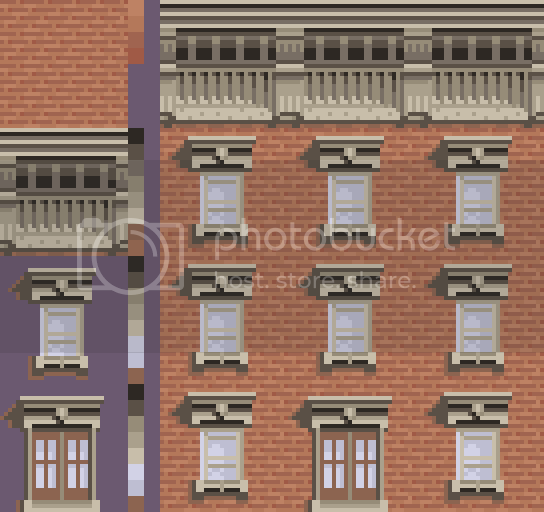 The building was from a photo reference, which helped me with my colour choices. No picker though, I like to avoid that thing. I've also gotten into the habit of keeping my colour's rgb values at multiples of 10 unless I'm up at 255 with a value. A little ocd but it just feels neater to me. 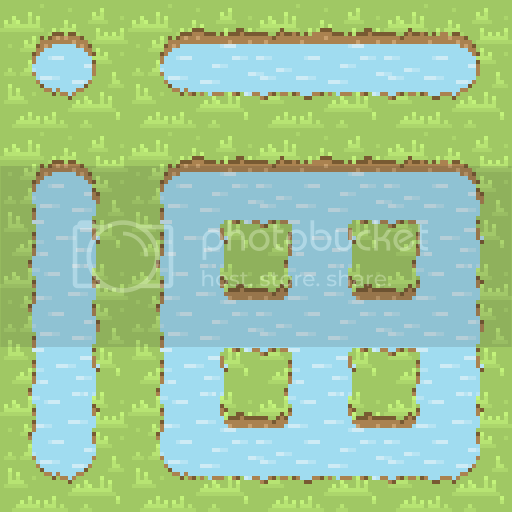 I just realised I didn't include my pallete for my waterway tile set :-/ sorry lol. Not part of the course. Just for fun. Last edited by Steasaurus : 09-08-2015 at 07:41 AM. Reason: Replaced image with version with less compression. LOL, this is like a work of some crazy artist at one of those museums. 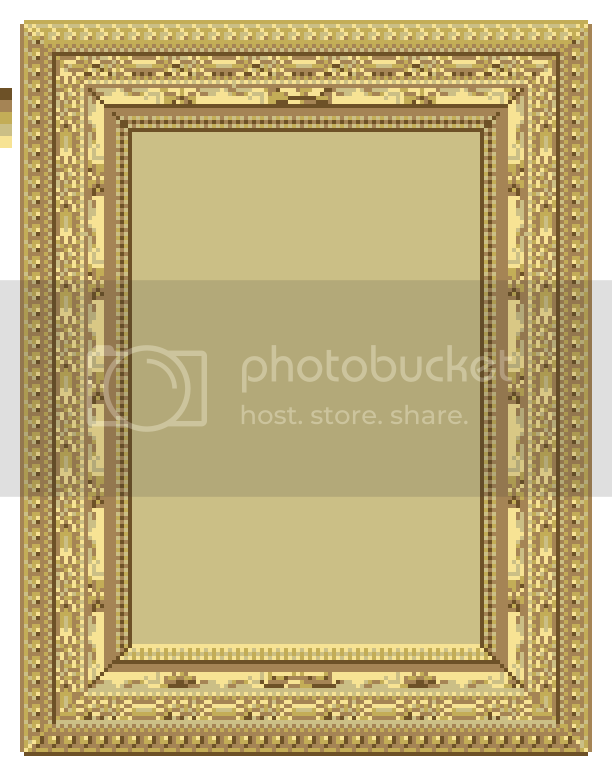 So the artist makes a frame. "Wher's the picture?" people ask - "that's the point, this is art that's not understood by everyone". Anyway, that's a pretty nice frame, for a portrait perhaps? Indeed it is for a portrait ;D I'll begin working on it shortly. Work in progress still. If I want to keep it 16 colours or less, I have 4 more colours to add. Certainly more challenging than I expected. This is really cool in a laughy way. 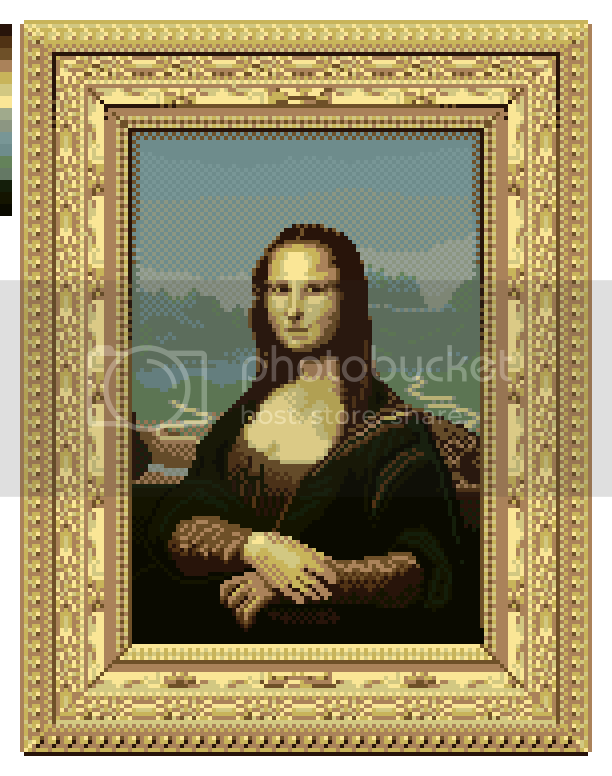 At times like these makes me wonder what would Leonardo do had he had access to such techniques, like pixel art. He oughta pause to eat something no? She looks great! Even has a hint of a smile. A little WIP from someone else's concept doodle. The wooden door texture is good, but the chimney brick pattern and the roof thatch are all very, very faint. It's good for a minimalist style, but I think you could bring them out more and also break the very hard geometric outlines you have going right now. I was actually going for a fairly simple geometric structure based on the simple lineart concept I was working from, but if that's jumping out as a negative then maybe I should consider pushing it a little further. It's scary to try and avoid the crisp lines, because jagged lines often look broken or far too obvious. But alas, since I'm going to have to rework the chimney shadow (that is definitely wrong and giving me brain ache) I will definitely have to destroy a chunk of the thatch texture, because the detail is true colour. No layer styles or transparency. So it will get trashed. I was actually expecting the first thing to be called out to be the chimney position in relation to that front window. There must be some crazy chimney breast going on inside that building. Not my design though. So it's not my place to meddle without first asking if there's a reason for it to be like that. I'm assuming it wasn't really thought out and that the chimney was positioned on the front side as an aesthetic choice rather than a functional one. ... just popped on to my browser and it reposted the post above. Don't mind me, I'm just editing out the wall of repeated text. I'll put the updated cottage in this post later tonight or (more likely) tomorrow night. Looking to seeing more pixel artwork! I recently went searching for Hue shifting for painting and stumbled across pixel art that i i became mesmerized in. I doubt i will attempt it, but it the visual appearance do look appealing.